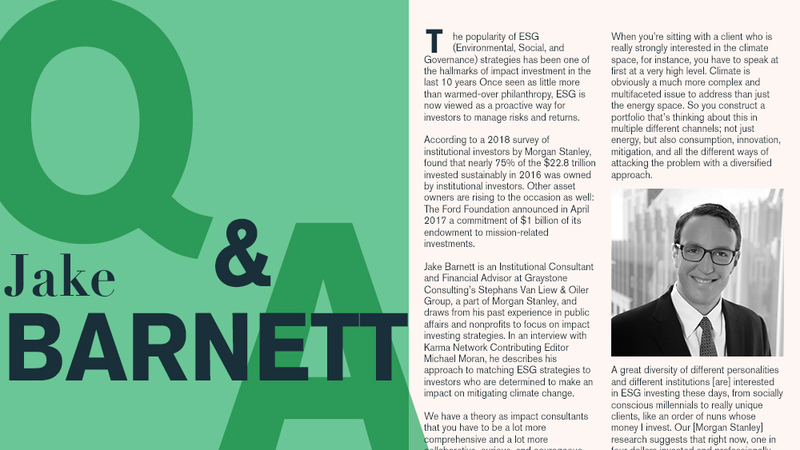 Karma Network | Jake Barnett on ESG Strategies: "It’s about...constructing a portfolio with the impact thesis of the client." The popularity of ESG (Environmental, Social, and Governance) strategies has been one of the hallmarks of impact investment in the last 10 years Once seen as little more than warmed-over philanthropy, ESG is now viewed as a proactive way for investors to manage risks and returns. According to a 2018 survey of institutional investors by Morgan Stanley, found that nearly 75% of the $22.8 trillion invested sustainably in 2016 was owned by institutional investors. Other asset owners are rising to the occasion as well: The Ford Foundation announced in April 2017 a commitment of $1 billion of its endowment to mission-related investments. Jake Barnett is an Institutional Consultant and Financial Advisor at Graystone Consulting’s Stephans Van Liew & Oiler Group, a part of Morgan Stanley, and draws from his past experience in public affairs and nonprofits to focus on impact investing strategies. In an interview with Karma Network Contributing Editor Michael Moran, he describes his approach to matching ESG strategies to investors who are determined to make an impact on mitigating climate change. Michael Moran: Clean energy, which we define as the renewables and related infrastructure industries here at Karma, seems like a natural fit for impact investors. The targets include everything from solar and wind turbine farms, manufacturers of their components, grid operators, as well as labs and startups pursuing efficiencies and solutions to related problems. As an impact-investment consultant, how do you help your clients find the right place for their money? Jake Barnett: We have a theory as impact consultants that you have to be a lot more comprehensive and a lot more collaborative, curious, and courageous than someone simply seeking to maximize margin. When you’re sitting with a client who is really strongly interested in the climate space, for instance, you have to speak at first at a very high level. Climate is obviously a much more complex and multifaceted issue to address than just the energy space. So you construct a portfolio that’s thinking about this in multiple different channels; not just energy, but also consumption, innovation, mitigation, and all the different ways of attacking the problem with a diversified approach. A great diversity of different personalities and different institutions [are] interested in ESG investing these days, from socially conscious millennials to really unique clients, like an order of nuns whose money I invest. Our [Morgan Stanley] research suggests that right now, one in four dollars invested and professionally managed in the United States has some environmental, social and governance characteristics incorporated. So you’re talking about pension funds [and] large hospital systems. You’re talking about foundations and college endowments. The concept of investing in ways that take into account social issues and ecological challenges has really entered the mainstream. One of the best examples is the letter from [Blackrock Chairman and CEO Larry Fink] predicting that if companies don’t integrate positive social impact into their model intentionally, they’re increasingly risking [their] social license to operate. Michael Moran: Let's start at the very top level. I’m an investor, and for whatever reason — mandates, the rules of a trust, or my own personal preference — I want to advance the cause of mitigating climate change but still make money doing it. What happens next? Barnett: We start with a very open conversation with our clients [to find out what their] priorities and values are. A client who’s very interested in ecological justice and focused on environmental issues is going to have a portfolio [that leans differently from] a client who is interested in affordable housing and social justice. There's going to be inherent overlap between those two, but they are very distinct. Then you’re also going to be driven in part by what their portfolio should look like from a traditional financial standpoint. Putting the building blocks in place, balancing equity, fixed income, and what different strategies make sense from an allocation standpoint, as well as what strategies make sense for them based on their theory of change as an investor — this is all custom work. The question is whether they view divestment as screening out companies that are to them morally objectionable, ordo they want to lean in and engage those companies to change them from within, or do they want to pursue a blended approach that uses both tools. We’re not going to be prescriptive as a consultant when it comes to those types of questions. We’ll be thoughtful and inform people about what we see others doing — the pros and cons of each approach from an impact and an ESG standpoint. Finally, I think something that’s always important to bring to the table in these conversations is the financially material impact that climate [change] is having [on investor behavior]. I emphasize that point because oftentimes the scientists and people who talk about climate [change] do it a disservice by discussing the impacts that are going to be happening 10, 20, 30 years from now. But you're seeing flooding today; you are seeing disruption to supply chain [today]. And I think that if you’re sitting in a fiduciary role, regardless of your values, you are risking stepping outside of the mainstream and violating your fiduciary duty if you aren’t asking very thoughtful questions about these issues. Michael Moran: So it’s very customized depending on the client, whether they want to divest from, let’s say, extractives in carbon heavy industry, or whether they are looking to find specific alternative investments that are playing in unit spaces like clean energy, storage or water conservation. How do you make those choices? Barnett: It’s about integrating your traditional financial discussions about constructing a portfolio with the impact thesis of the client. You aren’t just talking about financial capital. You’re also talking about the human and social capital that [exist] at an institution. Morgan Stanley just released a very good report on this, ‘Mission Align 360,’ that highlights some of what our clients are doing at all different levels to focus on the question of impact. Let’s take private equity impact investing as an example. Some clients are involved in sourcing and due diligence deals that they’re really excited about and that we can collaborate with them on. Ultimately they’re doing that because they have the experience, the appetite, and the time to. But many other clients don’t want to be as heavily [weighted] in the private equity and ESG space because they have [neither] the experience [nor] the risk appetite. So in that case we’ll talk to them about the public solutions piece. Let’s look at divestment as an example. Divestment has been successful in the past as a means of affecting change [because] investors [have used] their voice to explicitly express their issues with the fossil fuel industry. That amounts to finding ways to ask pointed questions about a company’s social licence to operate. So for these investors, the way they invest effectively is in the act of vocalizing and advocating for broader climate change and having divestment as an expression of that advocacy. Some clients are comfortable with being outspoken in this way; others aren't. Michael Moran: What about an investor who wants to have maximum impact in a much narrower space? Water quality? Methane capture? Grid intermittency? Barnett: It doesn’t need to be an either-or choice on that. Ultimately the direct investor deals with the niche area that they’ve predetermined, [in which case] we aren’t going to be as involved. When a client [follows] a passion to look at a really specific niche and early stage venture that they want to support, they will articulate that desire. 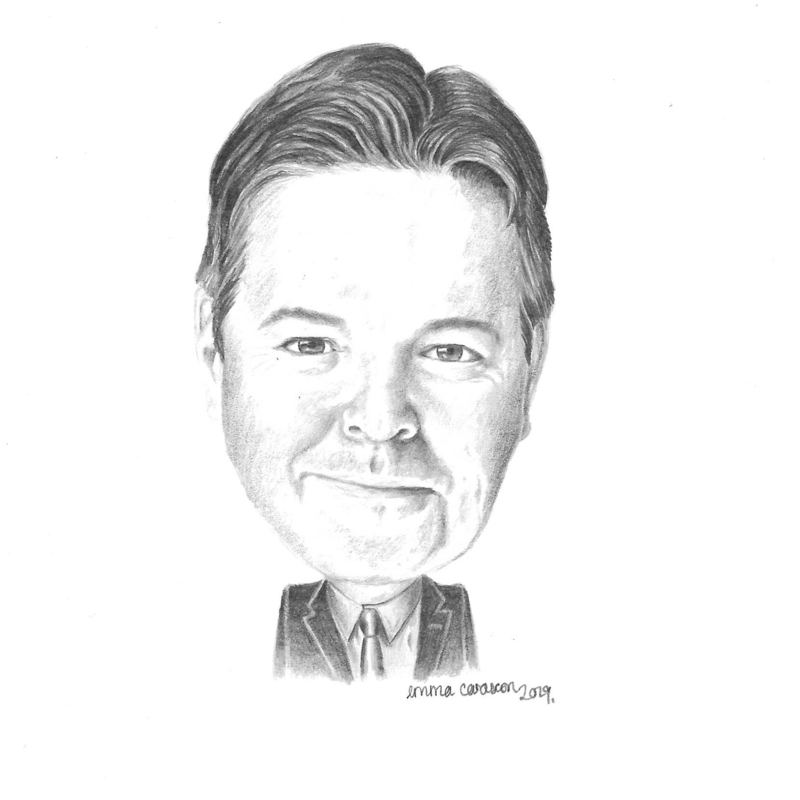 Michael Moran: Among the clients you engage with, what categories do ESG investors break into? Can you give me a sense of what that ecosystem looks like? Barnett: Let's talk about this in terms of the spectrum of capital that lies between two types of ROI: Return on Investment on the left, and the Return on Impact on the right. On the far left is traditional investing, which seeks to maximize return with no consideration of impact. The far right is philanthropy, where you're looking to maximize return on impact with little thought to traditional ROI. In between is room for an almost infinite mix of strategies. If you want to see this expressed in a very clear way, look at the work of the Heron Foundation on conscious portfolio construction. [This is] pretty easy to do in a passive investment sense. There are optimized indexes that you can basically say, “Drop out the top 200 carbon emitters and create an index in XYZ sector.” So that’s one option. The next rung would be [to weight] toward companies in that “E” bucket that have a stronger environmental record. That’s really going beyond the energy sector, where divestment tends to focus. So one example might be [to look at which] companies are really committing to carbon neutrality within different sectors. This could be a utility that’s vowed to move to a certain share of renewable energy within the sector, or,if you were a hospital or a chemical company, being progressive about how you deal with the waste you create. If we were looking at financial services and I were talking to a bank, I would be interested in what role carbon emissions and climate risk played in their lending portfolio. There are obviously options on the debt side as well, and to some extent, it can get more exciting with green bonds that support direct energy efficiency retrofits and affordable housing. You also can get into “thematic solutions” within public equities and public debt, where you’re focusing more [on sectors]. These all fit the ESG strategy. I'm investing in water funds, I’m investing in clean energy companies, I’m investing in companies that derive a large chunk of their revenue from delivering solutions to natural resource scarcity problems. When you move to the right a little bit more, you start to get into purer impact investment plays within areas like private equity. I can give an example in private real estate, [where] about 60% to 80% of the total holdings are on the coast. So a question I’ll routinely ask is, “How are you dealing with stormwater rise and more extreme weather events?” One time, a manager effectively told me, “Well, we only hold our buildings for about five to seven years, so it’s not a risk that we’re actively considering right now.” That was not an answer that I found acceptable. Another manager gave a very comprehensive answer, talking about how within their portfolio they’ll routinely do stress tests on the resiliency and the ability of the property to manage extreme weather events. [For example, that manager] ended up investing in a New Orleans hotel that was on one of the highest elevations in [the city] in part because of their worry about flooding. That hotel was one of the few to stay in operation throughout [Hurricane Katrina]. It was actually at full occupancy throughout the crisis because it was the command center for FEMA (Federal Emergency Management Agency). That’s one of the most concrete examples I’ve heard of [that demonstrates] the ESG element within the general private equity bucket. And once you’re into private equity, then obviously you open up a world of impact-targeted efforts, including companies that are delivering solar lanterns to replace diesel generators in Africa, and really cool renewable energy projects [targeting] resource efficiency and mobility in China. Jake Barnett is an Institutional Consultant with the Wealth Management Division of Morgan Stanley in 227 West Monroe Street branch. The information contained in this article is not a solicitation to purchase or sell investments. Any information presented is general in nature and not intended to provide individually tailored investment advice. The strategies and/or investments referenced may not be suitable for all investors as the appropriateness of a particular investment or strategy will depend on an investor's individual circumstances and objectives. Investing involves risks and there is always the potential of losing money when you invest. The views expressed herein are those of the author and may not necessarily reflect the views of Morgan Stanley Smith Barney LLC, Member SIPC, or its affiliates.